I ran along the A27, and then on a portion of the South Downs Way I had not used before, up to the deserted village of Balmer and back, in a stiff wind, heavy rain and very muddy going. I should have done seven miles; under the circumstances I think six and a half is forgiveable. I marked my 52nd birthday with a hill session in very wet weather: nine two minute climbs, with three minute recoveries and the usual mile warm-up and cool-down. I ran fourteen miles today out to Firle Beacon, then on along the course of the South Downs Way, down into the Ouse valley and Rodmell, then out on the road to Telscombe village and back to Piddinghoe where my son was sailing. Once more the surfaces were very muddy, so I was slow. Ten weeks till the Neolithic Marathon. It was drier than yesterday for a short run with Claire and Steffi round Stanmer Park, though it started to rain towards the end. I forgot to start the Forerunner, so probably ran a mile more than it said. I ran at lunchtime up through Stanmer Park, up the hill to Great Wood and on a bit of the way to Ditchling Beacon. One day I must run to the Beacon itself. This was supposed to be a five mile run with a central three mile brisk run, with one mile slow sections at either end. In the event, parts of the brisk section were uphill, or over very muddy ground, so may not have been as brisk as they should have been. Time and average pace for the three mile brisk section were 30.38/10.13. I was faster in the warm-up mile. I ran early in a damp morning to Newhaven West pier, to do a six mile slow run. Later, the weather was much better. I ran in dark drizzle along Seaford front, for eight 400m fast sessions with 200m recoveries, and the usual mile warm-up and cool down. I was not as fast as I should be (7 minute miles), but considering I raced on Sunday that's perhaps excusable. The new course for the Sussex Beacon Half Marathon is supposed to be faster, though I'm afraid I have to report the slowest time ever of my three attempts. Hastings, though hillier, is faster, at least for me. A new route took runners through more of inland Brighton, past the Jubilee Library. I started too quickly, and was struggling to keep my pace up by miles 10-11. The weather was not as good as promised. Eleven weeks till the Neolithic Marathon. PS: Monday. The results are up. I came 1370th out of 3202, gun time of 01:51:04, chip time of 01:49:45. 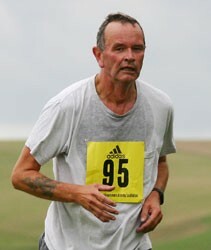 I was roughly 70th in my class, Vet Men 50-59, which I think consisted of around 190 runners. I had an agreeable short run round Stanmer Park with Claire. My participation in the Sussex Beacon Half Marathon may be in jeopardy, not through injury, but domestic commitments. Back to another route I used to run: across the A27, up to Newmarket plantation, then down to the A27 and back along the road. It was quite hard work, and though the sun was shining, still slippery underfoot.